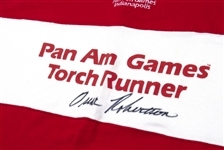 In August of 1987 over 4,000 athletes from 38 countries converged on Indianapolis, Indiana for the 10th Pan American Games. 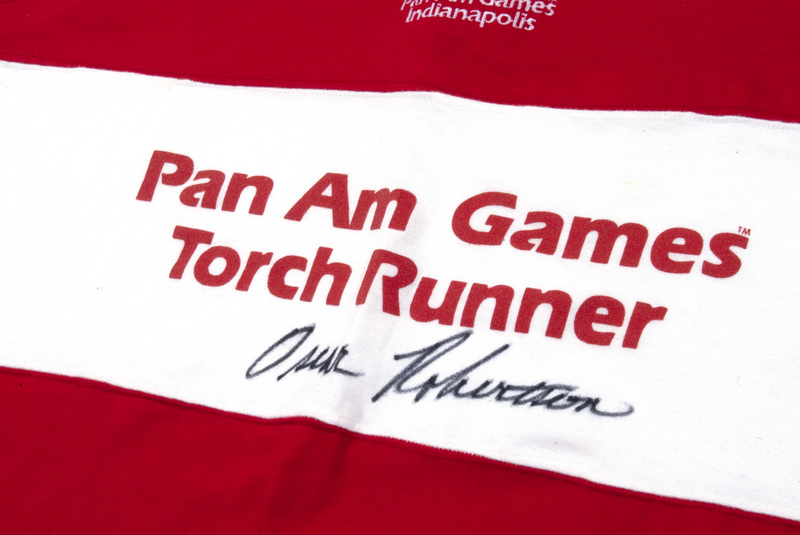 As a run-up to the international event, the organizers called on Indianapolis’ favorite son, Oscar Robertson, to be one of the torch runners. The former “Mr. Basketball” in the state of Indiana, Oscar attended local Crispus Attucks High School and led them to back-to-back state titles in 1955 and ’56. 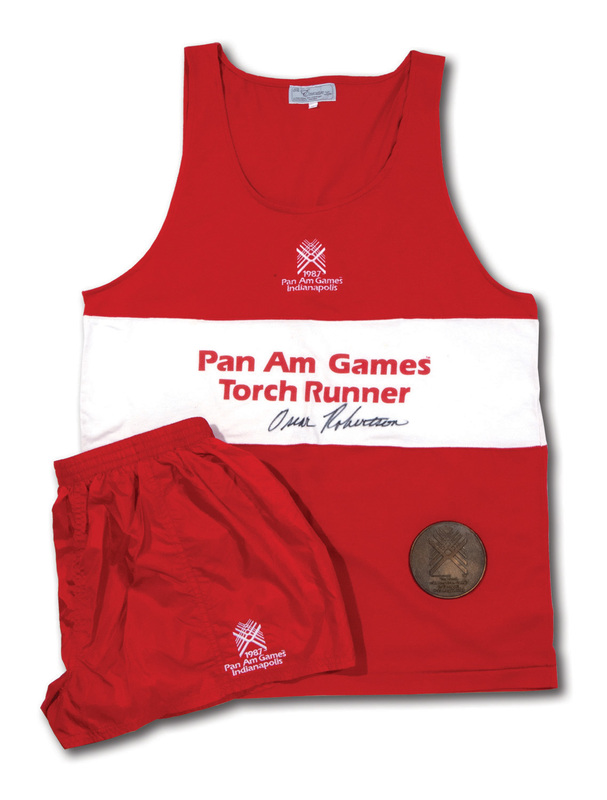 Presented here is the full uniform worn by The Big O as well as the special medallion presented to him for his participation as torch runner. 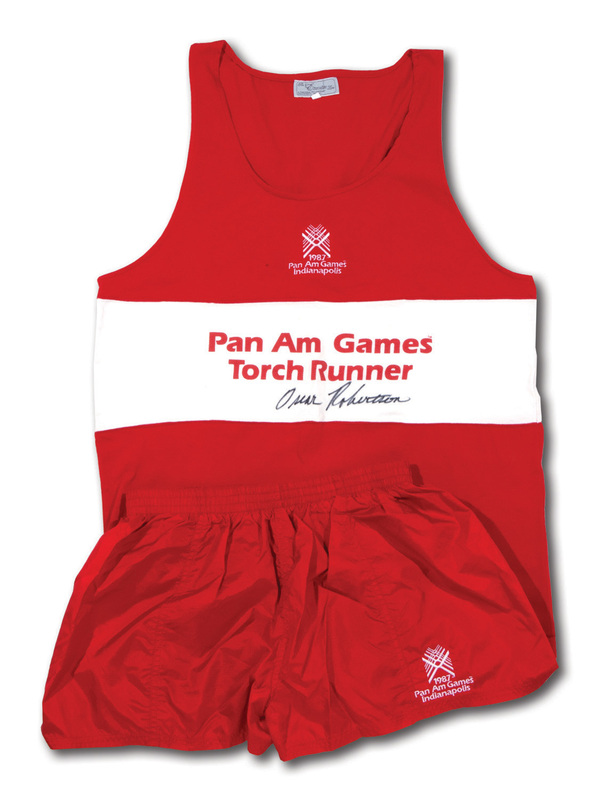 The uniform jersey is red with “1987 Pan Am Games Indianapolis” embroidered on the upper chest and a white strip bearing the title “Pan Am Games Torch Runner” in red. Robertson has signed the jersey in bold black marker just below. The matching runner’s shorts are red with the ’87 Pan Am Games logo in white on the left thigh. 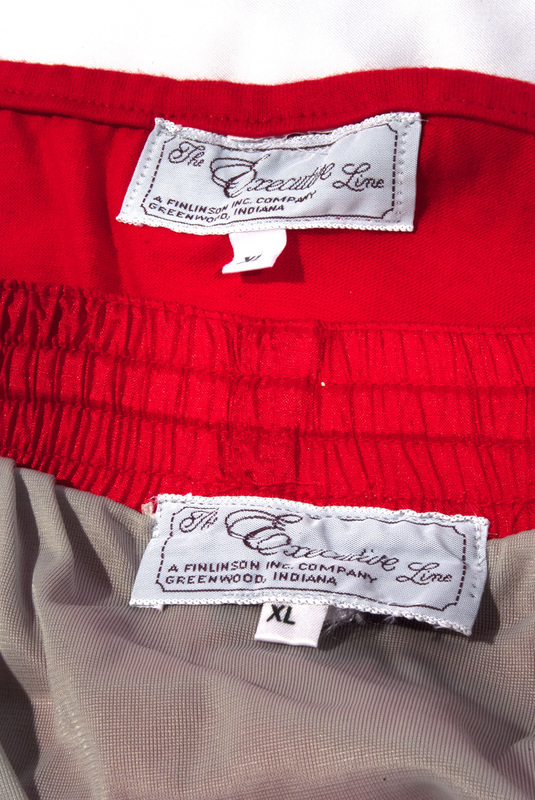 A Finlinson (Greenwood, IN) manufacturer’s label is found within each article along with an “XL” flag tag. 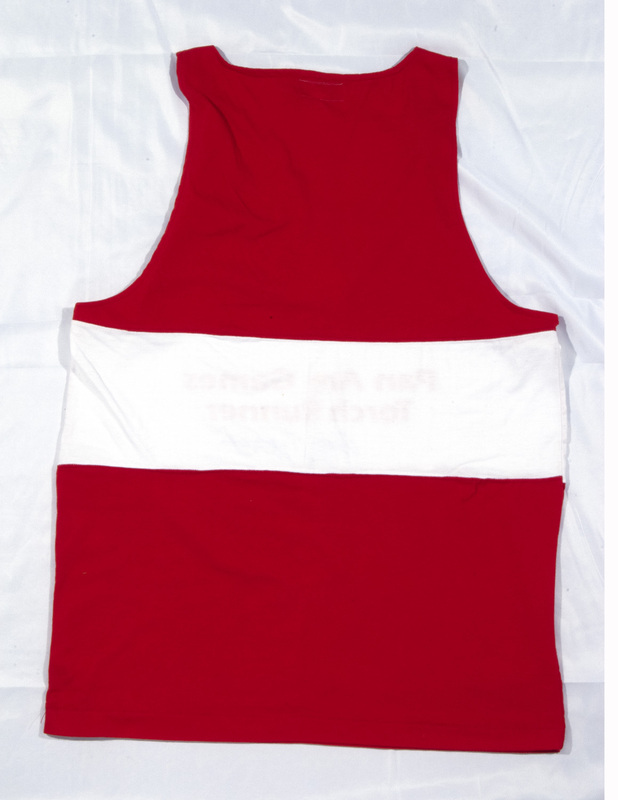 Both pieces show light wear and the colors remain bright. 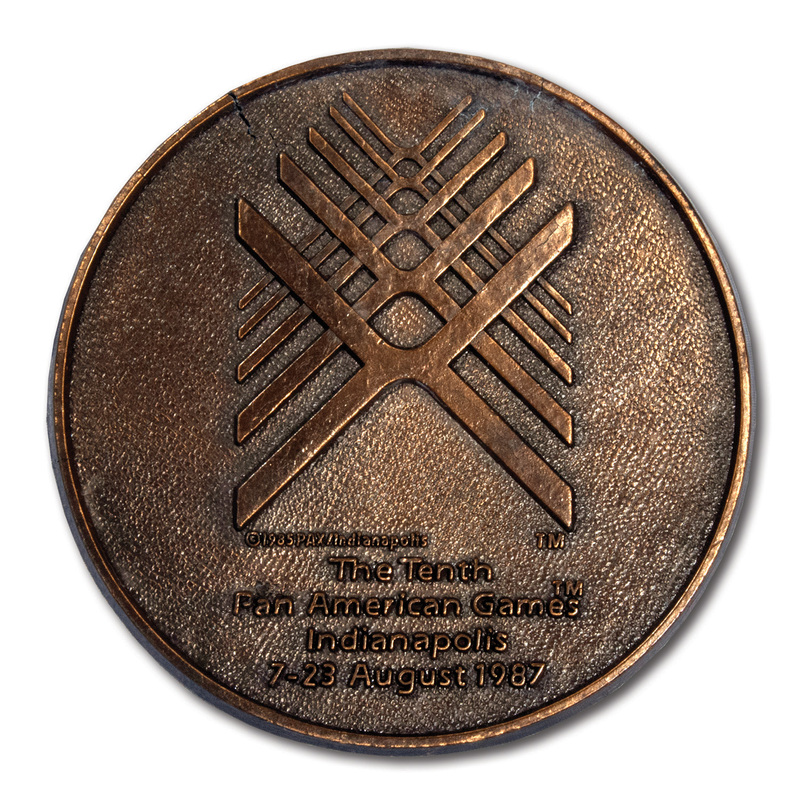 The roughly 3.5” medallion features the ‘87 Pan Am Games logo along with the dates and location on the obverse (blank reverse with tape remnants from when it was displayed in Oscar’s home framed on his wall for years. The 3.7-oz. medal shows has a crack in the surface around the 11 o’clock position, but the rest of it is in fine condition. A nice set of items showing how Oscar’s hometown proudly honored its favorite son on the international stage. Includes LOA from Oscar Robertson.